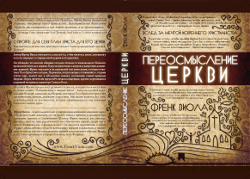 The book Finding Organic Church by Frank Viola is now available in Russian. The cost of the book is 60 greven or the equivalent of $3. In the e-mail, please write the name of the books, the quantity you would like to order, your full name and postal address. We will contact you with the details of costs of the books and shipping, and the means of payment. 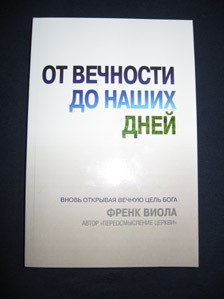 The book from Eternity to Here by Frank Viola is now available in Russian. You can also order the following materials by contactingTimmy Powers. 70 greven. 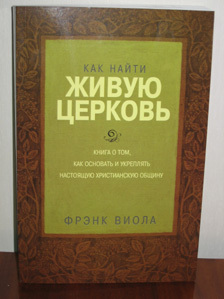 This book is in Russian. Churches have tried all kinds of ways to attract new and younger members - contemporary music,drama, livelier sermons, bigger and better auditoriums. But there are still so many people who aren't being reached, who don't want to come to church. And the truth is that attendance at church on Sundays does not necessarily transform lives; God's presence in our hearts is what changes us. Leaders and laypeople everywhere are realizing that they need new and more powerful ways to help them spread God's Word. According to international church starter and pastor Neil Cole, if we want to connect with young people and those who are not coming to church, we must go where people congregate. Cole shows readers how to plant the seeds of the Kingdom of God in the places where life happens and where culture is formed - restaurants, bars, coffeehouses, parks, locker rooms,and neighborhoods. Organic Church offers a practical guide for how to do the incarnational ministry that Jesus modeled for us. This material is available here in PDF format. You can order books by sending your order to this address- simplechurch.books@gmail.com. In the e-mail, please write the name of the books, the quantity you would like to order, your full name and postal address. We will contact you with the details of costs of the books and shipping, and the means of payment. The cost of the book is 70 greven or the equivalent of $3. So You Don't Want to Go to Church Anymore? Cost for Russian version: 70 greven each($3). We are glad to announce a great new book- So You Don't Want to Go to Church Anymore?. Now available for purchase(in Russian). We also remind you that we have two other books-Organic Church and Rethinking the Wineskins available, along with other great resources that can be read online. cry and be in awe of the love that Father has for all his children! It will challenge you to rethink what church is all about!